Why buy from a used vending machine dealer? I can save money buying off someone that has a machine listed on ebay or craigslist or any other auction listing site. But can you get good support if you need help setting up and testing your machine when it arrives, or after you have had it for some time? The answer is that we know vending machines and all the vending machines we sell as refurbished are 100% checked for complete of parts and functionality of all features of the machine. We give you lifetime phone support with all your purchases, and we know vending. Granted the vending machine is not a complicated piece of machinery but it does have some things that need to be done when you get it and we can make that process better for you. Why Buy From a company that sells and services vending machines as a business over a auction page or news paper ad? *Because the company that refurbishes vending machines as a business, puts that vending machine thru a series of test and procedures that make sure that the vending machine is in a solid working condition in all aspects before you get it. 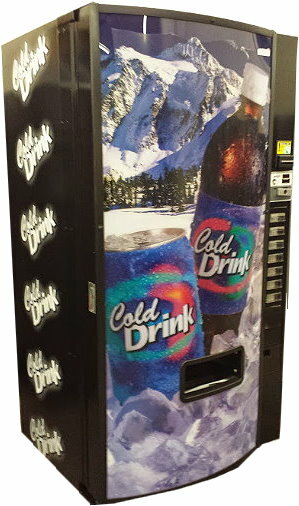 Vending machines have different features and these different features and options very from model to model of a vending machine. Some do cans only some do bottles that are only of one size, some can take credit cards and some can not. Some need software updates to bring them up to currant needs of money handling systems. Having a company who knows vending machines is well worth the extra cost in what you get with that machine over something listed on a site that sells anything and everything but services nothing. Did you know that Coke and Pepsi own their respected trademarks and that just not everyone has the right to use that trademark on a vending machine. Did you know that many of the bottlers do not sell their respected trademarks or even give permission to use them on these vending machines. Do you know what to look for to see if a vending machine has been in a flood or needs the condenser drain pan replaced because it is rusting out? What are the requirements in keeping refrigerated machine operating and do you know how to test the government required health safety features of a vending machine, or if it is even on the machine you are buying? We do and we make sure you do before you plug in your machine. Speaking of plugging in your vending machine, do you know how to test the circuit and make sure that the vending machine will work on that circuit? We are in the business of selling and servicing vending machines, we are not a one and done sale company and just because something is less money does not mean it is the better deal. I hope you will see the value in our company and the services we provide and I look forward to working with you. Thanks and please let me know if I can be of service in any needs.